Reports of congestion near malls across the region this holiday season make it sound like the recession never even happened. They also raise questions about how we handle traffic throughout the year. Expanding public transit is important, but shopping often demands using a car, especially on pedestrian-hostile Rockville Pike, as I discovered a few summers ago. Many strip malls along The Other Pike were built in the 1950's for local shoppers. Today, they've evolved into multi-story, multi-building campuses, drawing customers from across the region with a variety of high-end speciality goods. More shoppers means more cars, which has made Rockville Pike notorious for nasty traffic. The solutions below are designed to be implemented in time for next year's holiday shopping season. They're meant to be completed with minimal public intervention, though they would require some cooperation among private developers. And they will reduce congestion within the parking lot, at the mall's entrances, and on The Pike itself. - Raise awareness of all parking options. Each shopping center has a lot facing Rockville Pike, advertising to passing motorists that parking was available. But many shopping centers and even stand-alone stores and restaurants along Rockville Pike have additional parking areas that are often unknown to customers. Half of Federal Plaza 's parking is in a rear lot facing East Jefferson Street. Congressional Plaza sets aside spaces in the garage of an adjacent apartment building. And Montrose Crossing (pictured above) has not one, but two parking garages. They all usually sit empty because visitors see the lot in front and assume it's the only one. In a study of a Los Angeles neighborhood, UCLA professor Donald Shoup discovered that a lot of traffic comes from people looking for parking spaces. The same goes for parking lots along Rockville Pike. If motorists knew that were available in back or in a garage, they could go straight there rather than looking for a space in front. - Drop the "walk-off" policy. It prevents nearby office workers or Metro commuters from taking up parking spaces. But it also means that someone visiting two adjacent shopping centers has to drive and park twice, creating congestion on the property and on Rockville Pike as well. Last week, I went looking for a store in Congressional Plaza at Rockville Pike and Halpine Road. I then realized that the store was in the next block at The Shops at Congressional Village. Instead of getting back in the car, I walked two-fifths of a mile to the store, passing every other store in both shopping centers and stopping in a few of them. 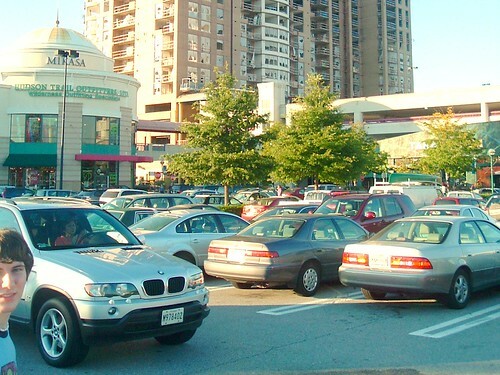 Shopping centers could create a privatized version of Montgomery County's Parking Lot Districts in Silver Spring, Wheaton and Bethesda. Property owners may resist sharing parking and customers with other malls, but it could benefit them. Visitors would spend less time trying to park and more time spending money at a greater number of stores. Disabled shoppers or those with large packages may continue driving from place to another. But it would reduce traffic from those able and willing to walk the extra distance. - Charge for the most convenient spaces. People will seek out free parking if they're using a space for hours at a time. But those in a hurry or running multiple errands will pay for the guarantee of open, easy-to-reach parking. Install meters at (non-handicapped) spaces within the first few rows of store entrances, give customers thirty minutes to shop and charge fifty cents. These spaces will turn over quickly, meaning more shoppers can visit the center. Those staying longer can park in free spaces further out or in garages, which in many cases are just as close to the stores. Not only will people know about other parking options, but they have an incentive to use them. Charging for all spaces could potentially backfire so long as a nearby shopping center still offers free parking. But it's a good way to ensure that parking spaces are available for customers. Both the City of Rockville and Providence, Rhode Island, which made public parking free during this year's holiday season, found that lots filled up with Metro commuters or office workers at the expense of shoppers who couldn't find a space. Long-term plans call for turning Rockville Pike between Shady Grove and White Flint into a string of urban villages akin to those along the Orange Line in Arlington. This will deal with many of the current issues surrounding The Other Pike today as it becomes easier for people to live, work and shop along the corridor without a car. But until that happens, implementing creative ideas like those above could provide quick relief to frustrated shoppers come next Christmas. I had a great experience with the free parking in downtown Rockville over the holidays; our company had its holiday luncheon on Dec. 17th at a restaurant in Town Center and it was great not to have to worry about finding a space or paying for parking! There were plenty of spaces available in the parking garage facing Rockville Pike, and I also went shopping in nearby stores after the luncheon ended. I hope the city does it again next year!